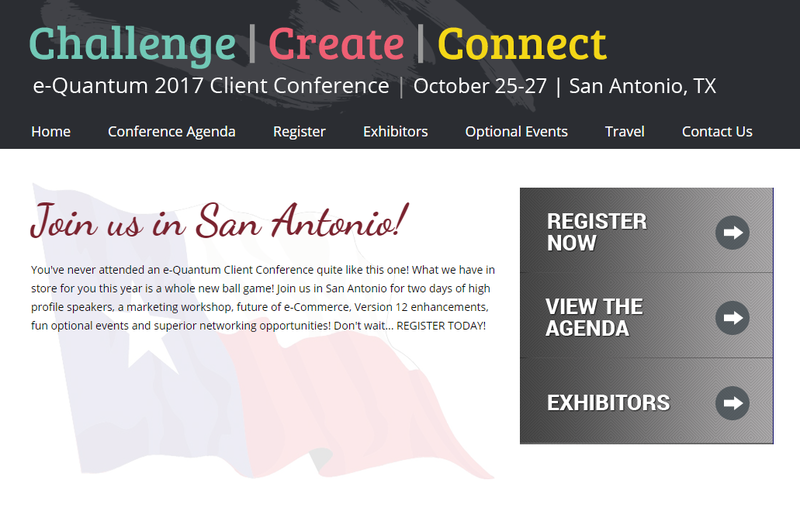 • Registration for the 2017 e-Quantum Client Conference is now Open! Registration for the 2017 e-Quantum Client Conference is now Open! You've never attended an e-Quantum Client Conference quite like this one! The conference website is now available, along with the complete schedule, session information, registration, optional events and travel accommodations. Join us in San Antonio for two days of high profile speakers, a marketing workshop, future of e-Commerce, Version 12 enhancements, fun optional events and superior networking opportunities! Don't wait... REGISTER TODAY! You can NOW assign permissions and access to Distributor Setup by user. This Quantum Net feature allows limiting rights to specific options in Distributor Setup. Individual users can be given access to only specific clients or certain functions within Distributor Setup or restrict outside consultants from accessing all sections of Distributor Setup. You can also limit users from certain clients in Q-Design. Logs are available and display changes that have been made by the Distributor User. Keep track of what is happening in your company! e-Quantum logs allow you to track what users are doing. The Maintenance Event Log now records the issuing and editing of coupons. Use the Email Log to confirm that Purchase Orders and Warehouse Releases were sent. Find out what has been deleted, by whom, and why with the Deletion Log. Change your document numbering to easily see who has issued a particular Purchase Order, Warehouse Release or Client Invoice. Review how to setup User Permissions within e-Quantum and check out the new group display. Get e-mailed alerts when someone voids a check or deletes a line item from a Warehouse Release. Whether you take a classical approach to marketing or have more of a "let's see what sticks" style, one thing is for sure - marketing is anything but easy. Businesses spend tens of thousands of dollars trying to elevate their brand, fill the sales funnel, and close deals faster. And in the Information Age, that responsibility fell squarely on the marketing department. But today we live in the Age of Referral, and in our hyper-networked, always-on, global business world, every staff member can be a marketer. Sima has taught her Sway Factor™ system to business owners, corporate staffs, and sales professionals around the world and the #1 thing they say is this: "You gave me the kick in the pants I needed to get moving, thank you!" Don't let another day go by without putting the power of Personal Brands to work! 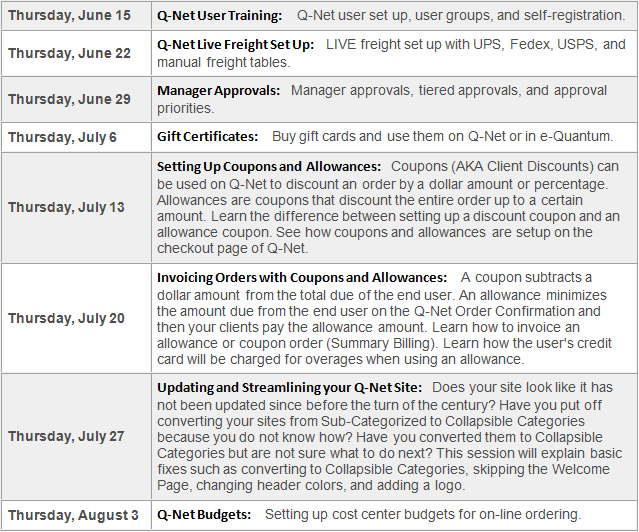 Would you like an easy way to keep your Q-Net orders together? Imagine that a customer calls to order both inventoried items and items that you source from a Vendor. Wouldn't it be easier if you did not have to enter the order information into both a Warehouse Release and a Purchase Order? Now you can avoid redundancy and connect related documents with a Sales Order. 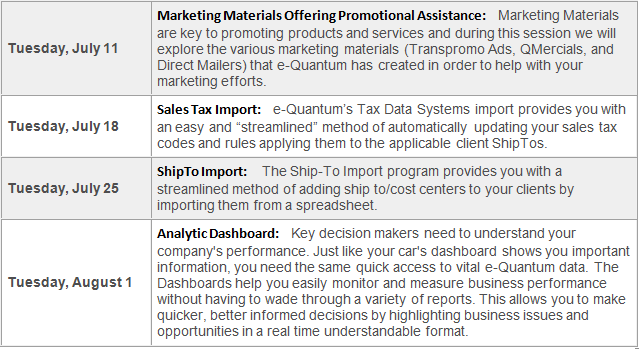 Enter the order information one time into the Sales Order and e-Quantum will do the rest, automatically creating any documents you need. NEW features include the ability to update the Ship Via with a screen notification to select which document to update with the new information. A line item summary has been added for Sales Orders, as well as a second packing list format that includes a barcode Sales Order number. You can also edit the item description on the Sales Order. Do you need to process rebates for a Retail site? Offer a referral fee? Have you purchased a client list and now need to pay commissions for it? Royalties are the way to go! We will show you how to setup the royalty structure, assign royalties to all or some of the client's items, add the payee as a vendor, run the royalty report (using NEW range selections), and have e-Quantum automatically create an AP vendor invoice. Do you truly know how to process month end? Are you doing it correctly and performing all steps necessary to properly close out month end? If your answer to these questions is no or you begin to second guess yourself, attend this session. You will not be disappointed! During this session, we will cover month end procedures for each module from Inventory (posting inventory to the GL), Order Entry (Commission report/update CNS History), Accounts Payable, Accounts Receivable, General Ledger and financial reports. Drill into the details and leave with a solid process for processing month end! 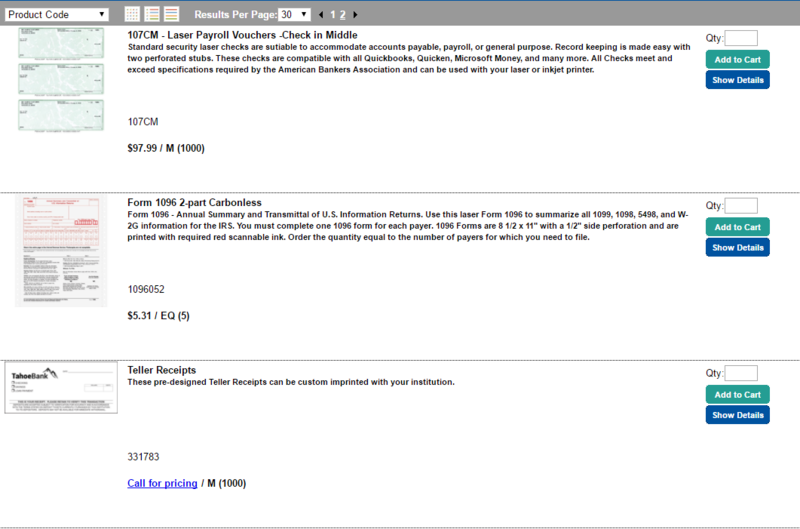 Plus, see new V12 enhancements such as the addition of a second sort option of Invoice Date or Invoice Number for statement printing, the Statement Cycle Field has been increased to 4 characters, in Period End Processing the Month Name has been added to the period and in Period End Processing you can drag your cursor to select multiple clients at once. To view the full agenda, click here! What was once PowerPay is now EVO Payments International. They're one brand to serve you even better! EVO makes secure payment processing a seamless part of doing business. Founded in 1989, EVO has grown into a global industry leader with innovative hardware and powerful software products, including the EVO Snap gateway, that power secure in-store, online, and mobile credit/debit card transactions anywhere on any device. Sign up for a flexible EVO Merchant Account and enjoy exclusive low rates for e-Quantum customers! Already processing? Switch and save. Contact EVO at 877.775.6900 and ask for a FREE savings analysis. Ever since Q-Net Subcategories, distributors have been asking for the ability to default which view the shopper has when they visit the site for the first time. Now you can! Just go to Distributor Set up > Site Appearance > Collapsible Category Setup > Item List Navigation > Default View for new Users. Options are: GRID, LIST or ENTRY. 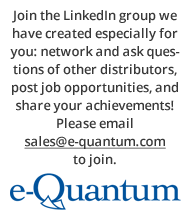 Please contact support@e-quantum.com with any questions. We at e-Quantum have been very pleased by how popular our Q-Design training videos have become. Those of you who infrequently setup variable print templates have found it immensely helpful to be able to refresh your knowledge whenever you want and watch them as often as you like. Now they are even better! We have updated their content and separated them by topic to make them easier to download and navigate. 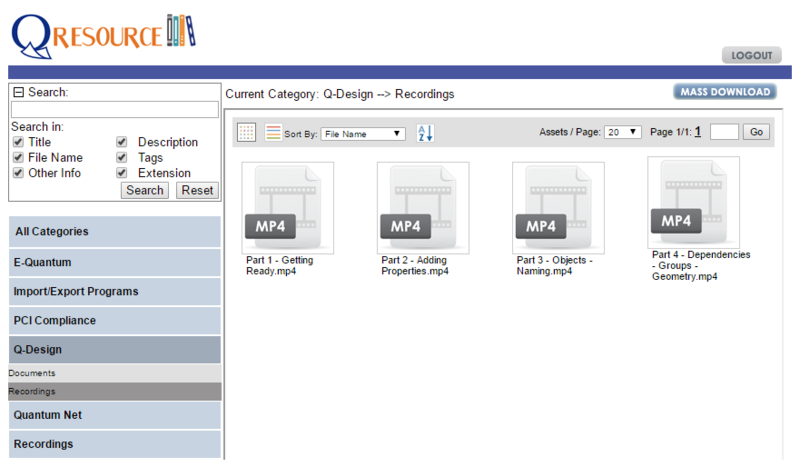 You can download the Q-Design training videos and other training documents and recordings from the Q-Resource Center by logging in to e-Quantum, clicking on Help and choosing Q-Resource Library. "Summertime" was written by famous Broadway composer George Gershwin. Gershwin became fascinated by the novel Porgy and decided to write an opera for it. The wealthy, high-speed New Yorker made many trips to South Carolina to immerse himself in the ways of the Gullah. Gullah are African-Americans with a distinctive culture including a musical style called "shouting" where spirituals are flavored with patterns and beats of hands and feet. The "Porgy and Bess" opera was not very successful when it was first performed in 1935 but "Summertime" has since become immortalized by well over 2000 official recordings. Singers such as Frank Sinatra (1947), Billie Holiday (1952), Sam Cooke (1957), Ella Fitzgerald in duet with Louis Armstrong (1958), The Beatles (1960), Billy Stewart (1966), Big Brother & the Holding Company (1968), Janis Joplin (1969), Willie Nelson (1979), and Annie Lennox (2014) have all brought their own interpretations of the song. So as the summer heat seeps into the world around you, don't forget to take some time to enjoy livin' easy. Here's your opportunity to learn all about e-Quantum's optional modules that are sure to enhance your business processes allowing you to grow your bottom line! Webinars will run on Tuesdays at 11:00am Pacific Time. Please Note: It is imperative that you attend all webinars you register for. Space is limited and others may be excluded due to no-shows. 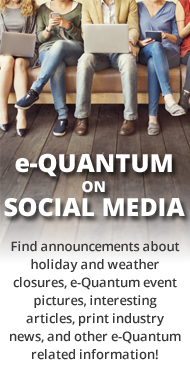 If you are unable to attend a webinar, please e-mail sales@e-quantum.com to cancel.